Progress continues on the construction of the boiler for The Unknown Warrior. Latest work has included drilling the Firebox Tubeplate as seen here in this picture. A full engineering update will follow next week. We have now reached a major turning point in the construction of 'The Unknown Warrior's' chassis, with a change in emphasis from manufacture to assembly. Much still needs to be done but with the last of the major castings now complete we are turning our attentions to the myriad of smaller parts which will be required. Less than a month from making the decision to manufacture a new wheelset for the locomotives bogie, rather than wait any longer for the possibility of a set from an 8F in Turkey, the first Wheel Centre has been cast. The 3D CAD data was supplied to Premier Patterns by the project's CAD Designer, Kevin West and the pattern cut in a polyurethene foam. Following the wheeling of the chassis at Tyseley Locomotive Works in late June the chassis was only display at the Tyseley Locomotive Works Open Weekend on 5th & 6th July, before moving back to Llangollen on Friday 11th July. That one small sentence does not explain the effort and logistics involved to move the chassis the 80 miles between to two sites. 'The Unknown Warrior' now has all three cylinders following casting of the second Outside Cylinder at Coupe Foundry, Preston, on 3rd July. 'The Unknown Warrior' is Wheeled. We realise that building a complex locomotive like the Patriot was never always going to be a straight forward exercise. The last few weeks have been interesting and challenging to say the least. From the outside it must have looked as though nothing was happening, but I can assure you it was a bit like a duck swimming across the lake, all calm above water, but below the legs are working furiously in all directions at the same time! Work continues at Tyseley Locomotive Works on preparing to fit the axleboxes into the main frame. All the Horn Guides have been polished to remove machining marks and the corners radii added by hand. All this has been completed to the usual high standard expected from Tyseley. The Axleboxes have had the brasses pressed in and the journals have been machined to the size of the axle. The bronze wearing faces are now being machined to the sizes determined from the frame assy. Following the casting of the first of the two Outside Cylinders last Wednesday evening, the casting has remained in the mould to cool until early this morning. The mould was opened and the sand broken away to reveal the casting. 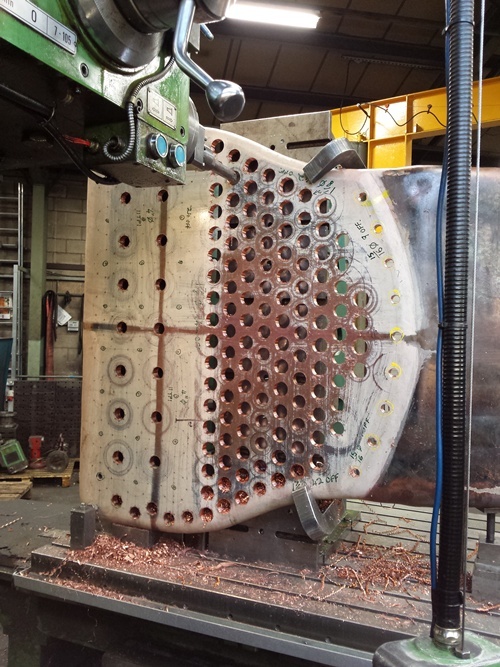 A group of project supporters travelled to Coupe Castings, Preston last night to witness the casting of the first of the two Outside Cylinders required for The Unknown Warrior. Five tons of molten SG Iron was prepared for the casting, the final casting weight was expected to be around 2 1/2 tons. The casting will now be left in the mould until the middle of next week to cool, before being broken out of the sand mould. Work continues at Tyseley Locomotive Works on preparing to fit the axleboxes into the main frame. All the Horn Guides are now ground and the frame assembly has been measured to determine how much to machine from each axlebox to get the axle centre in the correct position. The Axleboxes themselves have had all the remaining oil holes and fixing holes for the brasses machined in. The brasses are ready to be pressed in over the next couple of days. Work continues at Tyseley Locomotive Works on the grinding the Horn Guides ready to fit the axleboxes. A breakdown on the horn grinding rig has added time to the task, but this work is now expected to be complete in the next 10 days. Once the grinding is complete the frame assembly will be measured to give exact axle centres and the offsets established to final machine the axleboxes to fit. Following the flurry of activity to get the loco motive on its wheels for display at the Warley Model Railway Exhibition in November 2013, things may have appeared to have slowed down, but in reality it is still full steam ahead on the progress front. The two outside motion brackets and boiler support brackets have now been cast and have been machined. The cab has been ordered from R.D. Moore's at Coalville for delivery at the end of October. The driving wheels have had all the tyres turned at Tyseley Locomotive Works, where work on machining the driving wheel axleboxes has been completed. These will be taken to the Llangollen Railway Works to be fitted to the frames. The rolling chassis with cab and smokebox will be exhibited at the National Memorial Arboretum and the Warley National Model Railway exhibition during November. The completed driving wheelsets for 'The Unknown Warrior' were delivered to Tyseley at the beginning of July. The all-new Heritage Railway magazine-supported wheelsets have been assembled at Buckfastleigh workshops of South Devon Railway Engineering. At Tyseley Locomotive Works they will be balanced with lead weights, turned, and have the axleboxes fitted before being taken to the Llangollen Railway Works to be fitted to the frames of 'The Unknown Warrior' to enable the rolling chassis (minus the front bogie), to be completed. The driving wheelsets have nearly been completed at the South Devon Railway at Buckfastleigh. The final two crank pins were machined and fitted, and the balance weight plates were also riveted on the driving wheels during May. The final jobs that remain to be done are tyre turning and pouring of molten lead in between the balance weight plates. 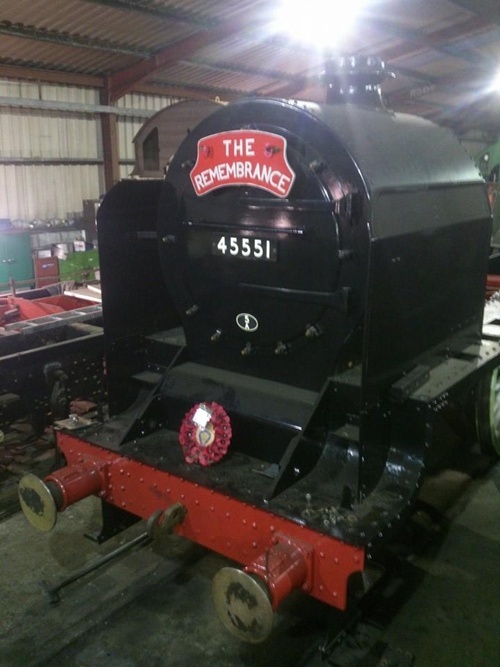 The Smokebox has now been completed at Crewe and was delivered to the Llangollen Railway Works on the 5th June. Volunteer LMS-Patriot Project painters and Llangollen Railway volunteers, Godfrey Hall and John Sandiford have painted the top coat and the smokebox now looks resplendent with its shiny black paint - ready to go on display for LMS-Patriot Project Members' Day. The middle cylinder for 'The Unknown Warrior' was 'knocked out' on the 29th May at the Coupe Foundry in Preston. BBC Radio Lancashire was there to witness this landmark occasion - the first major casting to be made for a standard gauge steam locomotive from a polystyrene pattern. 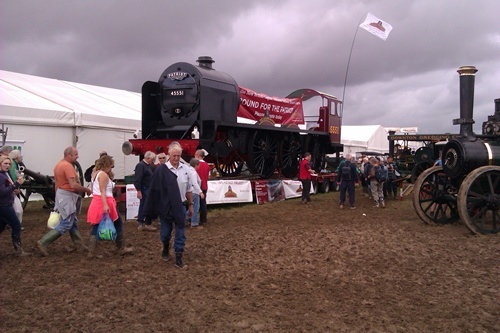 The fourth crankpin was machined during April at SDRE, at Buckfastleigh. The cylinder pattern for the middle cylinder and bogie parts were completed. Around 60Kg of lead was purchased for the driving wheel balance weights, although more will be needed. The LMS-Patriot Project, is pleased to announce that Heritage Painting has been chosen to paint the new ‘Patriot’ 4-6-0 locomotive - 'The Unknown Warrior'. Heritage Painting, the specialised railway vehicle painting service has already repainted high profile locomotives including ‘Mallard’, ‘Flying Scotsman’, ‘Dwight D. Eisenhower’ and Black 5 number 45407. Stretcher number 5 - the final stretcher that is needed for 'The Unknown Warrior' was delivered to the Llangollen Railway Works during March, after being cast at the Boro Foundry. The Lye foundry near Stourbridge has previously cast the other four frame stretchers, bogie centre pin, and driving wheels for 'The Unknown Warrior'. The bogie frame plates were cut during March at Morgan UK Ltd. Fabrications of Tyseley and were delivered to Tyseley Loco Works where assembly of the bogie will take place. Following on from the assembly of the three 6' 9" driving wheelsets for 'The Unknown Warrior' at South Devon Railway Engineering last year, quartering and fitting of the crank pins has now taken place. There are four different designs of crank pin that are needed for 'The Unknown Warrior'. The quartering of the crankpins ensures the correct alignment of the crank pins in relation to the cranks and axles. The lining up for this job took nearly two hours per crank pin, while the boring process took around a day to complete for each hole, with each cut taking around 15 minutes. About 30 cuts were required, depending on the final size of hole needed for each crank pin. South Devon Railway Engineering is believed to be the only railway engineering workshop that can do traditional crank pin quartering.